i realized after my last blog post...that something I've always struggled with, is opening up to people...a voice in my head says, "don't say that, that will be stupid or dumb, or no one really cares"....or i fear rejection, which has been a huge issue in my life. It hurts to be rejected, right down to the inner most parts of you...and for that reason, I don't even say things, then I won't have to worry about someone saying what I thought was stupid or whatever else I fear will come out of their mouths. My sister even says that I never tell her things...like they never even know if I like a guy or what I am planing on doing, all because I'm afraid of them rejecting my plans or likes. I remember years ago when I first started as a make-up artist, I was afraid to tell people confidently, "yeah, i'm a make-up artist", all because I wasn't making "a living" at it. Yet! The keyword was yet! Instead I would say, "well I work at a restaurant in Beverly Hills....", or, "I want to be a make-up artist". Well one night I was talking with an old song writer that wrote with the Beatles, and he, "Just because you aren't making money at something, doesn't mean you aren't an artist." He told me to start telling people what I am, because inside me, that's what you are. Just because you get a paycheck, that isn't the moment you become that, you've been an artist for years. And yes, when my little hands would draw pictures and nail them to a tree in my front yard, I was an artist. I used to draw for hours, entire seasons of my clothing lines...I loved it, and I would pretend I was like Betsey Johnson, Sonia Rykiel, or Karl Lagerfeld....I was a designer. I just found this from the ELLE blog, and my heart felt like it burst through the ceiling. They compared my "art" to Rei Kawakubo and Commes Des Garcons.......to know that I would be referred to in the same sentence as either one of those names makes me think, "are they talking about me!?! "....Those names have danced across the tv screen as I watched wide-eyed as a little girl soaking up all these runway images that seemed a world away from my living room. While other girls were playing house, I was imagining I was there, getting ready to be interviewed about my fall collection! I want each and every one of you to give your dreams wings, tell the world of the talents that you hold inside. Set them free to fly to all the places that have been locked in the dream chambers of your heart. You can do it! Thank you each and every one of you who has encouraged my heart with your loving words. You have no idea what those words have done for me, they have lifted me out of the deep holes of sadness and cruelty that the world dishes out on daily basis. but here is what was waiting for me on my kitchen counter when i got home last night....a big box full of make-up treasures from ELLE magazine for being the winner for 2 weeks in a row!!!!!! 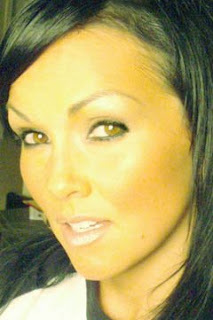 Thanks to all of you precious and beautiful souls....rocked the vote for the Kandee videos like people rock concerts!!! IT WAS LIKE A KANDEE REVOLUTION! i hope we can all be careful with our words...are we building others up or tearing them down? and to everyone that has been hurt or is hurting....know that we are stong, and beautiful, and the words only have the power we let them have. the countdown has begun....only a few more days til the first ever GLAMINAR...I just checked out the space where it will be today...and it is awesome! 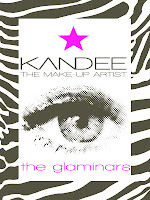 I also arranged a deal with NAIMIE'S...one of the most awesome make-up stores in LA...and they are giving all attendees of the GLAMINARS...25% off everything at their booths at the IMATS make-up show!!!! and so many more things are cooking up! I am so excited....if you want to sign up hurry...we will only be able to take cash at the door also! can't wait to see you all.....!!!!! yay! I just saw her on the ELLE magazine site (where my videos are featured right now....YAY!!!!! )...and her picture popped up with some super cute, twisted, updo.....and kandee thinks: "i want that hair too....and I will show everyone else how cute it is and easy to do! "....I adapted this look so it's more "wearable" for everyone, everyday...but if you want it more wild like this...just let more pieces stick out, and twist the top uo looser towards the back....have fun! I am so excited that I was chosen to be up on ELLE magazine's VIDEO STAR page......!!! YAY!!! I love ELLE magazine.....and they have a whole thing on GWEN STEFANI...and you know how we love her!!!! I am so excited that everyone has been so excited!!!! This is going to be more amazing than I first thought...we are going to have some great prizes and gift bags...and our venue has had to change due to the overwhelming amount of people that are coming!!! this is super requested...so we're headin' for THE HILLS!